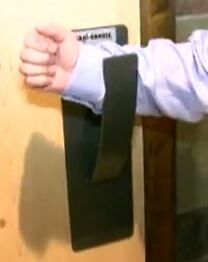 Restaurant customers in one Texas town are praising a new type of door handle that makes a trip to the restroom a lot more sanitary. The door handle costs $150.00 more than a regular brass handle, but customer satisfaction makes it a worthwhile investment. Do people really throw the paper on the floor? How rude! I sometimes use the paper towel to open the door, but then I stick it in my pocket and throw it away when I get the chance. Come on people, common sense! Good idea for the new handle shape, but I’m not sure why it costs so much!